Artist's Comments: The New Year presented me with a wonderful challenge. 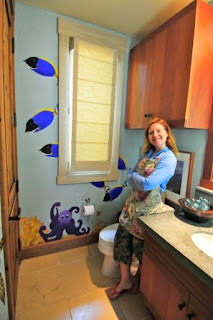 A Kukio resident asked me to transform her powder room and connecting laundry room into an under-water mural. We had developed the concept over the last six months. 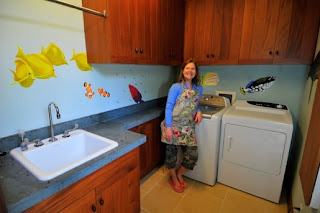 Her and her husband selected a handful of their favorite fish from their underwater snorkeling guide books and I created a composition on the walls for the placement of each grouping. To ensure I was replicating their vision accurately, I sketched the entire scene in pencil on the walls for their review and approval. 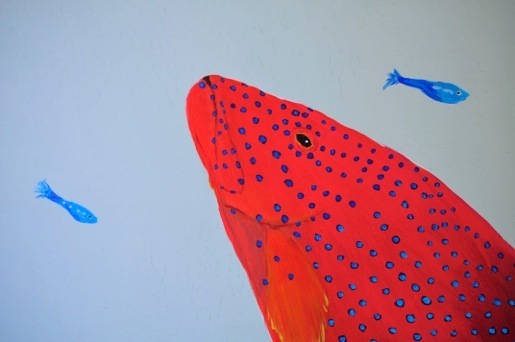 The size and scale of the sea life was important to get right. 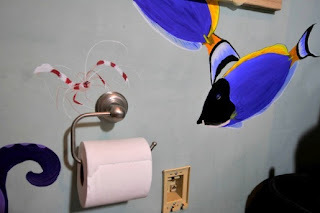 I invested in new mural paints to upgrade my supplies from regular house paint. The vibrancy of the higher grade paint was amazing! 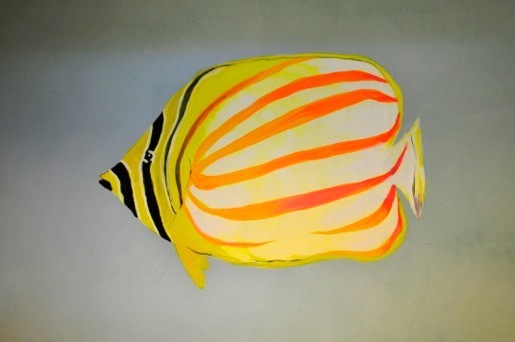 I could use layers of glazing to create wonderful depth to the fish and create unique mixtures of color since they did not loose their vibrancy when mixed. The timing of the project was so much slower than what I am used to when working quickly in wet oils. Luckily the acrylics dry quickly and were ready for another coat within 10 minutes. 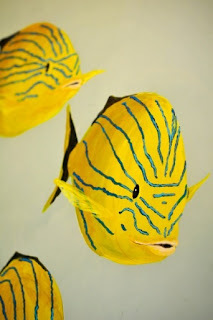 Because of this I found myself working on two different fish at the same time to allow for the dry time in between layers. This project was a record for me and it took me a good 8 weeks to complete in just painting alone. But, I really took my time to ensure no detail was overlooked. I wanted the fish to feel as if they were swimming off the walls instead of being just two-dimensional 'stickers'. I wanted them to be alive! In doing so, I would paint about 20 layers of color on a single fish in order to get the shading and colors just right. The turtles were my most favorite to paint. 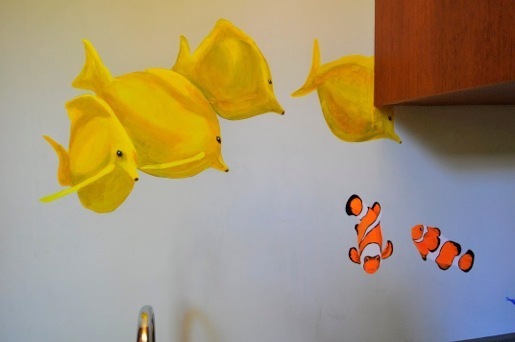 I sketched them in positions that helped them swim off the wall toward you. 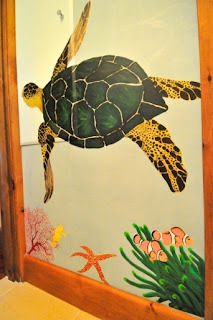 One of the most unique parts of the painting was a portion of the wall dedicated to their grand daughter who had a favorite purple octopus doll. We recreated it in the scene so she would have her own special sea create waiting for her. 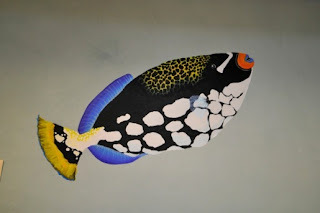 Other smaller animals were painted at the lower 'eye-level' areas including a small candy-cane shrimp, starfish, seahorse, clown fish, sea anemone, rasps and corals. When finished, the owner and her family were thrilled with the creation. We did decide on one addition; however. 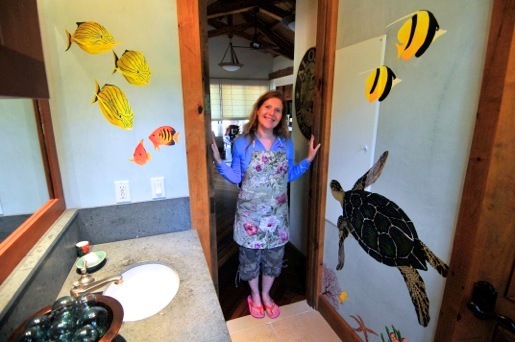 To bring in another 3 dimensional element, we decided to affix flat backed glass bubbles to the walls to replicate air bubbles floating up to the 'surface' of the sea. The walls had truly come to life; ready to take you an an underwater adventure! Here are some of the images closer up.